For Windows Vista, 7, 8, 10. 12/04/2016 - Release version 0.0.3. - Fix typo in updater module. 12/04/2016 - Release version 0.0.1. 28/04/2016 - Release version 0.0.4. - Fixed issue connecting after sleep recovery. 12/04/2016 - Release version 0.0.2. - Fix icons on non retina displays. Once your subscription is active, here is how to configure your operating system. Please have your Username, Password and address of the server you want to connect. 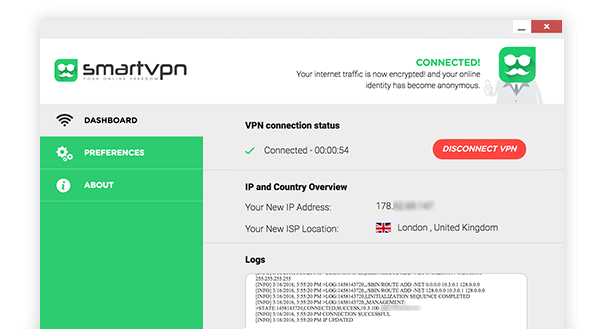 Enter one of SmartVPN servers addresses (you can get them from your client interface) to which you want to connect in the Internet Address field and click Next. Set SmartVPN in the Destination name field. To log on, click the Network icon on the bottom of the panel that appears to the right of your screen. Press Win + i (the Windows key and the letter "i" at the same time). Click on Control Panel in the panel that appears on the right. In the Control Panel, click Network and Internet. Click Set up a new connection or a new network. Choose Connect to a workplace then click Next. Click Use my Internet connection (VPN). Click the Network icon on the bottom of the panel that appears to the right of your screen, select SmartVPN, then in the window that appears, click Properties. On the Network tab, change the Automatic option to L2TP IPSec VPN in the drop-down list. On the Security tab, select Properties, select the ‘Use a shared secret key’ and enter it in the "Key" field and press "OK" twice. (you can get the secret passkey from you client area). Click SmartVPN, then click the connect button. For 32-Bit Click the link OpenVPN 32bits. For 64-Bit Click the link OpenVPN 64bits. Validate the download by clicking Save File. Start the installation and wait OPENVPN to be the installed. Once installed, You must download the configuration files from your client area and unzip it to the following path: C: Program Files \ OpenVPN \ config. Once done, click Start, click All Programs, and then finally on OpenVPN OpenVPN GUI. In the Windows systray area, you should see the OpenVPN logo. Right-click it with the mouse button, select the server you want to connect to and click Connect. If everything is Ok, you should be connected to smartvpn(The openvn logo should be green) . Open ‘Networks and Sharing Center’ from ‘Control Panel’. Choose ‘Set up a new connection or Network’. Choose ‘Connect to a workplace’and click ‘Next’. Click on ‘Use my Internet connection (VPN)’. In ’Internet address’ field type one of the addresses of SmartVPN servers. In ’Destination name’ field type SmartVPN. Also check the ‘Don’t connect now, just set it up so I can connect later’, and then Click ’Next’. Click the ’Close’ button to return to the ’Network and Internet’ screen. In the Internet address field, type one of SmartVPN servers. In the Destination name field, type SmartVPN. Type in your Login and Password in their respective fields; leave Domain blank. Click Create and then Close. In Network and Sharing Center, click Change adapter settings. Right-click your new connection (SmartVPN) and click Properties. On the Security tab, change the dropdown box from Automatic to Layer 2 Tunneling Protocol with IPsec (L2TP/IPsec). Choose Use preshared key for authentication and insert the secret key from your client panel. Double Click on Ok and Connect. Once done, click Start, click All Programs, select OpenVPN and then OpenVPN GUI. In the Windows task bar, you should see the OpenVPN logo. Right-click on it, select the server you want to connect to and click Connect. On the 'Security' tab, click 'Properties', select 'Use a shared secret key' and enter the secret key from your client panel in the ‘Key field’ and press ’OK’ twice , then connect. Start the installation and wait until OPENVPN is installed, and then download the configuration files from your client interface and extract it to the following path: C: Program Files\OpenVPN \config . Right-click on it, select the server you want to connect to and click Connect, you will be asked to authenticate using your SmartVPN login & Password. Open Network settings in System Preferences. Select VPN for the interface, PPTP for the VPN Type, and enter SmartVPN for Service Name. Select the newly created SmartVPN connection. Enter one of the SmartVPN servers adresses in the Server Address field. Type your Login in the Account Name field. Click Authentication Settings and enter your Password in the Password field, then click OK. Select VPN for the interface, L2TP Over IPSEC for the VPN Type, and enter SmartVPN for Service Name. Under Machine Authentication, click the radio button for Shared Secret. Enter the shared secret password you get from the Control panel and the blank field, then OK. Select 'Open Private Configurations Folder'. A new window with the folder 'Configurations' will appear. Now you need the SmartVPN’s OpenVPN configuration files for Tunnelblick, it can be downloaded from the Control Panel, Extract the entire contents into the 'Configurations' folder. Close the window when done. Select One of the SmartVPN Servers you would like to connect to and it will prompt you for your username and password. When it’s entered, Tunnelblick will attempt to connect. Select VPN for the interface, IKEV2 for the VPN Type, and enter SmartVPN for Service Name. Enter smartvpn.org in the Remote ID field. Enter your username in the Local ID field. Click Authentication Settings, select Username in the first field, enter your Username and Password, then click OK. Tap the General buttonTap VPN. Tap VPN > Add VPN Configuration. In the Description Filed, enter the SmartVPN. Enter one of SmartVPN servers adresses on Server Field. Enter your Credentials in the Account and Passwod Fields. Leave Encryption Level as default (can be left on Auto). Check Send All Traffic (Must Be On). Tap Save and press the HOME button to exit the settings page. To connect tap the VPN button in the settings page to connect. On the secret Filed, Insert the SmartVPN’s shared Secret. Due to the limitations of IOS, you have to email yourself the config files, First, Download and extract the config files on your computer, Choose one of the configs and send them via email to the address you're using on your iPad/iPod/iPhone. You must send The .ovpn File and and the certificate (.CA File). Once you received it on your Email, Select it and choose the option "Open in OpenVPN"
Enter login data (username and password) into "User ID" and "Password". Tap the Connection button to connect. The app will now attempt to connect to the VPN. Ouvrez les Paramètres Système de votre téléphone Android. Appuyez sur Plus ... dans la section de la 'Sans fil et Réseaux'. Appuyez sur Ajouter un réseau VPN. Type SmartVPN dans le champ Nom. Sélectionnez PPTP dans le champ Type. Entrez l'une des adresses des serveurs SmartVPN dans le champ Adresse Serveur. Activer le cryptage MPPE et appuyez sur Enregistrer. Appuyez sur Enregistrer les informations de compte. Appuyez sur Connecter pour vous connecter à SmartVPN. Sélectionnez L2TP/IPSEC PSK dans le champ Type. Entrez clé secrète SmartVPN (vous pouvez l'obtenir à partir du Panneau de configuration) dans le champ Secret L2TP et appuyez sur Enregistrer. Téléchargez et décompressez les fichiers de configuration à la racine de votre carte SD ou dans la mémoire principale. Naviguez jusqu'au dossier où vous avez enregistré les fichiers de configuration. Sélectionnez le fichier de configuration du serveur que vous souhaitez connecter. (l'extension du fichier est. ovpn), puis tapez sur 'Sélectionner'. Entrez vos informations de connexion dans "Username" et "Password", cochez la case 'Enregistrer'. Select IKEv2 EAP in the Type field. Enter your login credentials into "Username" and "Password"
Click the newly created profile.